PBH-204 is a programmable IoT device, which connects to the Internet via wired or wireless LAN. It supports various networking and security protocols, and encryption algorithm. 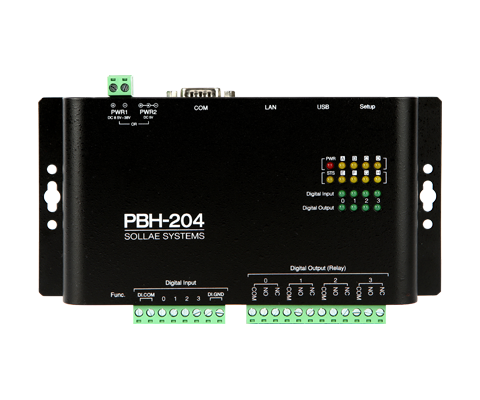 PBH-204 is equipped with four high-voltage digital input ports and four relay output ports. This allows you to monitor and control the high-voltage equipment through the Internet according to your own way. It is equipped with one serial interface to connect and communicate with sensors or equipment which supports RS232, RS422, or RS485. This allows you to collect data from serial equipment/sensors and send it to various systems through the Internet, and vice versa. PBH-204 is embedded with a PHPoC interpreter, letting you pre-process data as you want before exchanging by writing a the simple PHPoC script. It is very flexible to create customized devices to meet the diverse needs. Moreover, PBH-204 comes along with an embedded web server, letting you do system setting, control and monitor your equiptment via web browser from a remote site. PBH-204 is a great choice to build customized IoT gateway solutions to interact with your existing systems.